grading of a coin, so much so that it can increase the ask price by as much as 400% on the open market. Collectors will pay a lot of money for a certified coin graded MS65 because someone has set it's value and grade. However, most collectors don't understand the various points of grading that resulted in that MS65 certification. Upon close examination of an MS65 graded coin you find the luster is nice and near full. It will also have real eye appeal with no discolorations. The strike is detailed, but not razor sharp. There will be bagmarks on this coin but none will be deep or rub away details. This description of an MS65 coin's condition is fairly typical. However, many collectors may expect a coin graded MS65 would have better surface quality and that there would be a complete absence of bagmarks. The following will help highlight the finer points of grading United States mint state (MS) coins. Short descriptions of specific grading characteristics of the eleven grades of mint state coins, MS70 through MS60, are listed below. The definitions are designed to be quick reference points and to describe, in general, grade characteristics of coins that fall into each of the eleven specific grade categories of mint state. Many U.S. issues have specific striking characteristics that professional graders take into consideration before assigning a grade. These brief grade explanations do not address any specific coin or any one single U.S. Type coin. Instead, they are generalizations. Make a copy of these grading characteristics. They may come in handy at the next show you attend or you could find them useful when grading your own coins you currently have in your collection. Listed below are general grade characteristics for United States mint state coins. MS70: No imperfections under high magnification. A perfect coin. MS69: Any imperfection, hairlines, etc, are virtually undetectable under magnification. Finding mint strike U.S. coins graded this high is rare. MS68: A very prominent, well defined strike. Full mint luster. Outstanding eye appeal. No visible marks of any nature are present on the coins surface under average magnification power. A coin with outstanding surface quality. MS67: Above average strike. Full mint luster and attractive eye appeal. A few tiny marks may be present and even one single hidden mark near or at an important design area of the coin may exist. No more than one significant mark. MS66: Above average strike. Full mint luster is required for the MS66 level. An MS66 graded coin should have above average eye appeal and be considered attractive for the issue. A few, small scattered marks may be present, but not a single, large obvious mark that detracts from the overall nice appeal of the coin. MS65: The strike should be at least average for the issue and preferably sharp for the issue. The luster should be above average although full mint luster is not required like MS66 and MS67 grades are. Bagmarks can be present, but should not detract greatly from the coin's overall beauty. 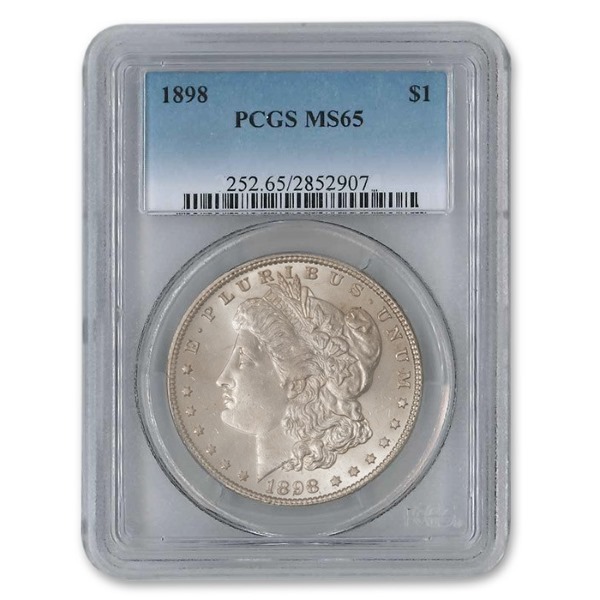 Generally, MS65's are above average for the issue with attractive luster and are appealing coins overall. MS64: The strike is average and preferably slightly better than average. Luster should be at least average for the issue. Full mint luster is not required. Average strike for the issue. Bagmarks are present, sometimes heavier than others. MS63: An average uncirculated coin for the issue. Full mint luster is not required, nor is full strike. Average eye appeal is sufficient to make this grade. Bagmarks are present and can be heavy at times, but they should not overwhelm the overall appeal of the coin. MS62: Slightly below average strike, luster and eye appeal. Bagmarks may be heavy and the coin's surfaces may have some large, detracting ones. MS61: Heavily marked with dull, unappealing luster. A MS61 graded coin may look slightly better than a MS60, but the difference is marginal at best. A very below average, generally coin lacking appeal area of mint state. MS60: An often unattractive, possibly impaired coin with surface distractions and scuffed, heavily bagmarked surfaces. Yet, no signs of circulation. If you have a large collection of coins and need to discuss it's value, please give GoodLife Auctions a call at +1 866 294 0150 and ask to speak to a coin appraisal specialist. We can assist you with both graded and un-graded coins.